Two Russian men were arrested in Kamala on fraud charges yesterday on Sept 15 after police discovered the men using fake ATM cards in Patong and Kamala. 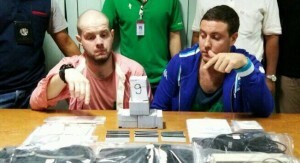 Police seized more than 400 unused cloned electronic cards in a subsequent search of the men’s hotel room in Patong. Kamala Police Deputy Chief Lt Col Chokdee Mabangyang and Region 8 Police led by Lt Col Prawit Engchuan presented the men – named by police as Russian nationals Evagenii Zavialov, 27, and Pavel Ryzhankov, 33 – at a press conference at Kamala Police Station yesterday. Presented as evidence seized in the making the arrests was B5,000 cash, six ATM cash withdraw transaction receipts from Krungsri Bank, 48 fake electronic cards, a notepad containing ATM card numbers with corresponding PIN codes and 427 unused electronic cards with no serial numbers. Police also seized one Acer tablet, Sumsung notebook, skimming equipment and other items. The men were arrested at a police checkpoint in Kamala at 2pm after local police were alerted that the suspects were heading their way. “An investigation team from the Provincial Police received a tip-off that two foreigners, both white males, on a black-and-red Yamaha motorbike with license plate number “1 KorChor 3288” were travelling around using fake ATM cards at several ATMs in Patong and Kamala,” Col Chokdee explained. “Police were told the two men had just left the Patong area and were heading to Kamala,” he added. “ So we set up a checkpoint waiting for them. Officers signalled for the men to stop when they approached the checkpoint. We found them in possession of 43 fake ATM cards and B5,000 cash,” Col Chokdee said. “Police later searched a room at the Royal Prince Residence in Patong, where officers discovered 427 cloned electronic cards, skimmer machines, a computer tablet and other evidence,” he said.